LOVED “The Stand”. 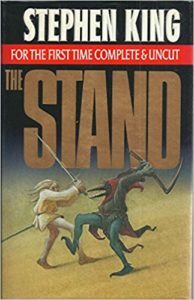 Honestly, I don’t read my Stephen King because his books seldom end happily and that’s the payoff for me when I read books with horrible things that happen (and why I prefer Dean Koontz in that genre), but “The Stand” was really amazingly well done, IMHO. I’m actually both fascinated by and horrified by the idea of weaponizing disease. I imagine, one day, war WILL come down to this. I do hope I’m not around, though living in the zombie apocalypse might be interesting. 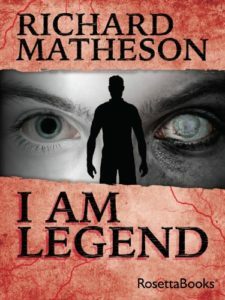 I saw the movie “I Am Legend” and didn’t love it. Have you seen the movie? Is the book lots better? You’re right about most Stephen King books not having a happy ending. The Stand was a nice exception to that rule. Yes, I’ve seen the movie for “I Am Legend.” It was okay, but they changed so many details from the original that it was almost like a completely different story entirely. The book was much better in my opinion. Lydia – great post!! if you’re looking to start a new Nora Roberts ( I replied to your comment on my post before I read your!) Then her new book YEAR ONE is an apocalyptic story about an end of the world virus called THE DOOM. Thank you, Peggy. I just requested Year One from my local library. Thank you very much for the recommendation. The Stand is one of my favorites as well (of course, I love SK, so there is that). 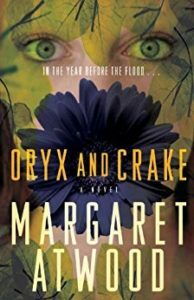 I like Margaret Atwood’s books… but not familiar with this one. Will have to check it out. I hope you enjoy it! Since you liked The Stand, I’m guessing that you will. These sound wonderful! 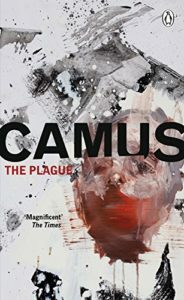 Perfect reading for this time of year! 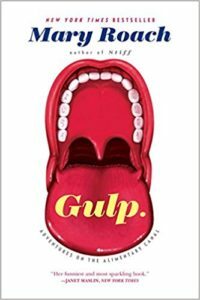 Thanks for the list–i was looking for something suitably engrossing–emphasis on the gross. Lydia, what interesting suggestions to read. 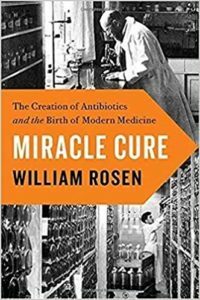 I have read something about the 1918 flu disaster but not this one. Will surely do so. I’m not a Stephen King person but…you may have persuaded me to read “The Stand”. Also, very nice looking post. Thank you, Sorchia. I hope you enjoy the grosser books on my list. They were both well written and a lot of fun to read. Thanks, Kathy! 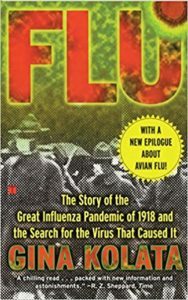 That book about the 1918 flu pandemic is the best one I’ve read about this topic so far. I hope you like it. The Stand isn’t like a lot of Stephen King’s other books. I have no idea if it will be your style, but I’m glad you’re giving it a try. I’ve not read any – and I doubt I will because that subject scares me. Probably because, well, as far as the flu goes, we are currently dealing with a flu that reporters keep saying is the worst season in a long time and it’s deadlier. So, if I ‘do’ take a stab at any on your list, I’ll wait until we are safely out of flu season. Thank you! I can’t blame you for being afraid of this topic one bit. From what I’ve heard, this year’s flu season is far more severe in the U.S. than it has been in Canada so far.